Then heaven and earth will be at peace with you. For there is but one single entry to them both. The stairs by which to ascend. We’re not born with a Map of Life but this Tarot spread gets pretty close. You’re here to embody your soul as fully as possible and these four Tarot cards can help you with the how. 1. 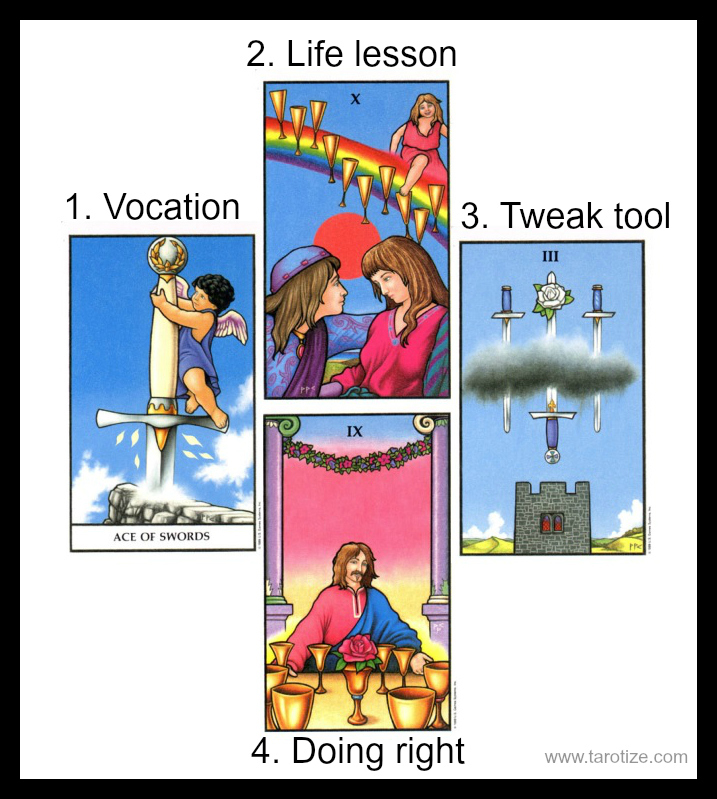 Vocation – This card gives you a clue about your life purpose in terms of your career or vocation and shows you how to maximise on the gifts of the Spirit bestowed upon you before you were even conceived. 2. Life lesson – This card shows you the main theme you need to explore and study in this life time in order to fully embody your soul. 3. Tweak tool – This card shows you where you often stumble and need to pause for breath/prayer in order to realign. 4. Doing right – This aspect of your soul’s embodiment is already working for you. Drawing on this strength can only help! 1. Ace of Swords (Vocation) tells me that I am here to sow seeds in the form of new thoughts and ideas. “The pen is mightier than the sword” popped into my mind when I turned this card over, so it is connected with my writing. 2. 10 of Cups (Life lesson) is no surprise in this position since family life has been a source of many (difficult) lessons since birth. This is also a card of communion with the family of mankind on a larger scale. 3. 3 of Swords (Tweak tool) shows me that whenever I isolate myself or cut myself off (either vertically or horizontally), I need to pause and pray for guidance rather than succumb to feelings of loneliness or despair. Loneliness has almost become my comfort zone and this is not helpful in terms of my soul’s embodiment. 4. 9 of Cups (Doing right) tells me that one of my greatest strengths is the ability to find contentment in the little things… But more than that… I can’t help but look at this card image (reminiscent of Jesus at the last supper) and think that of all the decisions I made, the decision to give my life to the Lord was then one the brought me the most peace and joy. He is my Shepherd and I shall not want. Hope you enjoy trying this spread for yourself and I would love to hear what you come up with in the comments below!